In a trendy San Francisco art gallery, out-of-towner Vin Vanbly witnesses an act of compassion that compels him to make investment banker Perry Mangin a mysterious offer: in exchange for a weekend of complete submission, Vin will restore Perry’s “kingship” and transform him into the man he was always meant to be. Despite intense reservations, Perry agrees, setting in motion a chain of events that will test the limits of his body, seduce his senses, and fray his every nerve, (perhaps occasionally breaking the law) while Vin guides him toward his destiny as “the one true king.” Even as Perry rediscovers old grief and new joys within himself, Vin and his shadowy motivations remain enigmas: who is this offbeat stranger guiding them from danger to hilarity to danger? To emerge triumphant, Perry must overcome the greatest challenge alone: embracing his devastating past. But can he succeed by Sunday’s sunrise deadline? How can he possibly evolve from an ordinary man into King Perry? A Bittersweet Dreams title: It’s an unfortunate truth: love doesn’t always conquer all. Regardless of its strength, sometimes fate intervenes, tragedy strikes, or forces conspire against it. These stories of romance do not offer a traditional happy ending, but the strong and enduring love will still touch your heart and maybe move you to tears. God help me – I’m in love. 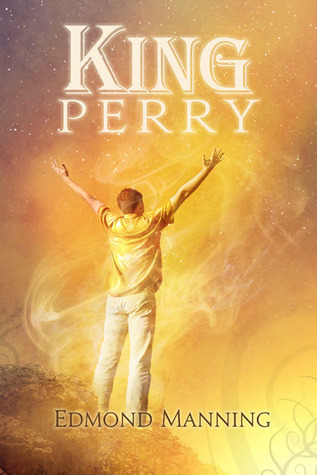 King Perry is akin to a long, emotive, poignant, dream. It’s surreal and complicated, but at it’s core its message is really quite simple: love. And the story of King Perry asks: if you only had one chance, just a few moments in the space of your lifetime to create something mind-blowing, to give a gift so extraordinary and life changing – how far would you go to achieve it? How much would you risk for love? What MC Vin Vanbly would do, is nothing short of extreme and wonderful. What Edmond Manning has done with this story is nothing short of extreme and wonderful. King Perry is, in short: extreme and wonderful. It’s original and thoughtful. Layered beyond belief and profound. It’s also LOL funny – seriously! I can only assume that this story lived in Manning’s mind for a long, long time before and while he wrote it, because to have the idea of King Perry and then to create all the other intricate, masterful details that carry the story along is a huge, HUGE feat. These characters are divine. The concept is unreal. And I can’t forget to mention that there’s a duck, who is quite frankly one of the most awesome supporting characters ever written – seriously x2! “The sun seems fascinated to get closer to this paradise landscape, and keeps dropping half inch by half inch in the west. Tenderly he flies to his lover, the Ocean, who twists in delight with is imminent arrival. So, before you begin reading King Perry (and I pray, you will), I ask you to stop where you are and shake yourself off. Take some deep cleansing breaths and prepare yourself for a ride unlike one you’ve had before. Brace yourself for Vin’s constantly fast paced, almost erratic mind. Open your mind to the wonder that’s created within these pages, because I can assure you, it’s not what you’ll be expecting. Purchase Links: Dreamspinner, Amazon, ARe. I adore this book. At first, as I was reading I kept trying to make it more mundane, and getting frustrated when it veered off course, but once I let go of expectations it was just the greatest ride ever. Beautiful language, unexpected moments, emotions that made me laugh and cry on the same page, and love even if it wasn’t HEA love. I can’t wait for the third book coming out soon. Kaaaaaje, yeeeeeessss. This book has returned to me so many times since finishing it. I feel like it is one of the most remarkable things I’ve read – and I HATED not knowing how to express that. I mean, how do you review something like King Perry? How do you tell people that it’s so much more than they could imagine? And yes! The love! That incredible love that Vin had for Perry. That absolute, unwavering love – that despite not being a traditional HEA – was the purest love. I loved that when Vin described his love for Perry, that you (as a reader) had to let go of all pretences for traditional love. Their world was their own and the kind of love that Vin shared was/is not to be compared to any other. You have to let go of all assumptions and just accept everything that Vin (and the kings) had to offer. Gosh, Sue…I’m completely blushing and…honored. I don’t know what to say (which is a hard thing for a writer). I’m absolutely you enjoyed Vin and Perry’s adventure. I had so much fun writing this book and loving these guys. And, Quackers! I should send you the ‘working cover art’ I made for myself while writing this book. Of course, it features my favorite duckling looking proud and beautiful and vulnerable all at the same time. SO HAPPY YOU LIKE KING PERRY!! And shout out to Kaje, who has been an unwavering cheerleader from the very start. Kaje, you lift my heart up. Did I mention that you complete me? You have a picture of Quackers looking proud and beautiful and vulnerable??? *dies* That damn duck owns me! And I can still picture Perry holding him. In the interest of full disclosure, I should inform you that I’ll be attending GRL and that despite my best intentions, it’s likely that I’ll be a blubbering mess. So, if you’re wondering who the cooky Aussie giving you creepy stalker vibes is – well, you’ll know it’s me. I’ve been wondering what to get at Dreamspinner (25% off sale) and I think you just helped me make up my mind. Thanks!! oh Barbra, that’s awesome. :) Would you come back and let me know if you end up reading it? So happy you read the book and liked it!! Lovely review, Sue! You’re right; this does look promising! This entry was posted on September 3, 2014 by Sue in Contemporary, Fantasy / Fairy Tale, Reviewer: Sue and tagged 5 Stars, Dreamspinner Press, Edmond Manning.